If you've been to Austin lately, you know that rentable, app-based electric scooters have descended upon the city like locusts. For some, they're as distressing as the plague; for others, the grab-and-go rides are just an extension of one's limbs, they're so easy to use and ubiquitous. But let us be unambiguous: Electic scooters are not a part of your body, and you certainly should not use them to commit crimes. And yet, a 19-year-old Austinite was arrested Thursday for robbery by threat, according to a report by the Austin American-Statesman, and he was caught because he made his getaway on one of Uber's Jump scooters. The robbery occurred on December 18 at the BBVA Compass Bank on Sixth Street. He approached the teller while wearing a hoodie and handed her a note demanding money. She gave it to him, and he fled, as one does after one robs a bank. The crucial difference in his strategy, however, was that instead of diving into a white van and shouting, "Step on it," as happens traditionally, he just hopped on a Jump scooter and sailed away. And was spotted by an employee doing so. 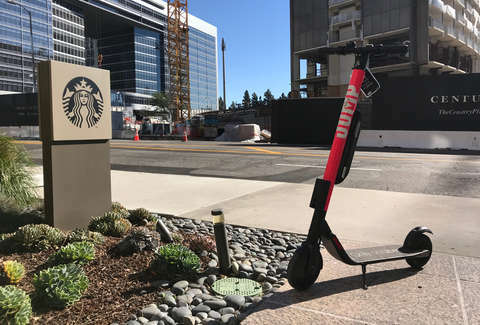 Police then checked video footage from the bank and subpoenaed Uber for the account information of whoever had used the scooter. This got detectives his phone number, email address, and credit card number. All of which you have to enter to use the service at all. One would think this would have disqualified the vehicle in the planning phase. And yet. Also, those scooters don't go very fast.